Hi Mandie, thanks for stopping by at my blog. When I walk outside of my apartment (whether I am going camping or not) I never leave behind the following: 1. My keys, so I can get back in, 2) something such as lip balm to relieve cracked lips if someone makes me laugh, 3) a few tissues, to blow my nose, so I won’t have to use my sleeves (it’s not socially acceptable, and toilet paper is too rough), 4) little baggies to pick up after my dog, and my cell phone in case I forget my keys. I do wear a medic alert bracelet and I found out the hard way that medic alert bracelets are no guarantee. The EMT’s that transported me last August were too lazy to access the info I had taken the trouble to put up online. Partially these dudes are to blame. The hospital mixed me up with someone else who had a name similar to mine, and while inpatient I was given her medications! I plan to blog about this in the future…medic alert bracelets are not a guarantee…Best bet is being in the right place at the right time. Just wade into the river, open your mouth, and if it is your lucky day, a fish might swim right in. Dinner! 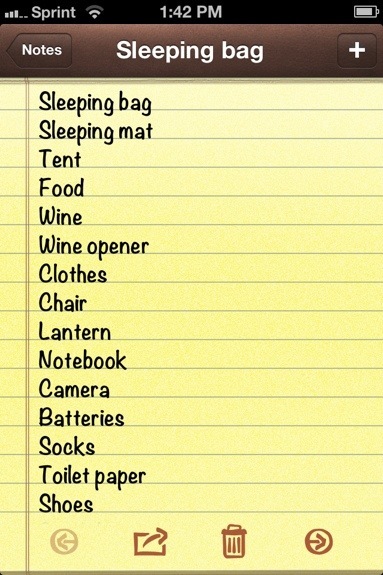 Goodlist, except I don’t see matches on the list, for cooking & lantern. Where is the the Corn hole boards? or is that just an Ohio thing?